Tsunami Charity Special  Get this PocketDock for only USD/EUR 9.95 (usually 14.95). The price will be entirely (!) donated to the Japanese Red Cross. Offer limited to 500 PocketDock FireWire ad 1,000 PocketDock Combo. Read the press release for details. Simply irresistible: The PocketDock Combo is an indispensable add-on for the iPod, Apples sensational and wildly successful MP3 players. 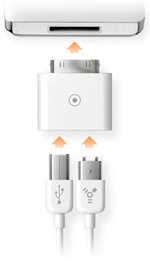 The tiny PocketDock Combo lets you connect the iPods docking port to a standard USB or 6-pin FireWire cable, thus delivering on the iPods promise of freedom and independence. The PocketDock Combo is a perfect choice if youre a PC user or work cross-platform. When you’re on the road with your iPod, listening to your favorite hits, you may unexpectedly want to connect to another Mac or PC. When you need it most, you’ll probably find that you didn’t bring the special iPod docking cable  it’s at home connected to your computer. Since you can find USB cables almost anywhere  just unplug a printer or scanner  the PocketDock Combo lets you get connected, anytime, anyplace. Charge your iPod's battery from any powered (6-pin) FireWire port, found on all current Macs and many PCs. The iPod mini, as well as the iPod with Click-wheel can also be charged from a high-power USB port. Like to travel light? The PocketDock Combo is the tiny, elegant solution. Its beautiful design is a perfect match for the iPod, and it fits in your wallet. If you already bought accessories for the previous-model iPod, such as a car charger, the PocketDock will let you use them with the latest model. The fastest way to own the PocketDock Combo: Order now! All PocketDock models are compatible with any iPod with Dock connector (for details see list in right column). The PocketDock Combo costs US$ 14.95 and is available now through our online store. Get yours now  you’ll wonder how you ever got along without it! P.S. : Looking for a FireWire only PocketDock or a way to connect your iPod to your home stereo? Check out our other PocketDock models: FireWire, Line Out FireWire and Line Out USB. Order your PocketDock anytime from our convenient online store. We ship world-wide. "Brilliant travel-ready size and design." "...a must have add-on for your iPod." "...perfect for [...] those who never know what kind of computer they may come across in their travels." "...we think SendStations line of PocketDock adapters are must-have accessories for your iPod." "...it quickly becomes an indispensable addition to your iPod." "...a perfect solution ... a must have." "I never have to worry about forgetting my dock cable again." "Perfect solution to a silly but annoying problem." 1. No support for FireWire. USB only. 2. Supports FireWire only for charging, not for syncing. 3. 3G iPods (touch-wheel) DO NOT support USB charging. PocketDocks fit many cases. Click here for details. Share this site with a colleague or friend who’d be interested in the PocketDock.